The Timbales 13″ x 14″ with Stand by Gear4Music are a set of shallow single-headed Cuban style timbale drums with a robust metal casing. Not only does this pack include two great sounding 13″ and 14″ drums but it also comes complete with a durable and adjustable stand allowing you to enjoy making unique Timbales Rhythms in comfort. 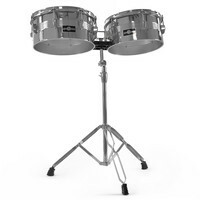 This entry was posted in Gear4Music and tagged Drums-and-Percussion. Bookmark the permalink.